Hello, I am a 66 yr old man/boy wishing to repeat a marathon in time related comparison to my 2h 59m 15s which I did when I was 50. In the interim I have not done serious running or training but have coached football and athletics at Primary School having done necessary courses with relevant sporting bodies so have been pretty physically active. I now live in Roi-et Thailand and have to train in the local Park which is beautiful but both circuits are on concrete paviours. I can run on the road which I do occasionally but if you have ever been here you will understand what I mean when I say that you need to be ready to leap into the hedgerows at every moment. Last year I spent 12 months preparing with a number of injuries due to trying to do too much on the concrete before I was ready. My maximum runs were 30K; two in the month before the marathon and I am doing 20K on a regular basis throughout the year. These long runs are done at about 1.5 minutes / km slower than the time I hope to run in the marathon. Last year I was well over confident and tried for a 3.30 marathon as the tables relating my past marathon told me I should be able to do that. I did a 1H 45M 21 Kilometers but at 25K started to get cramp everywhere and had to jog my way to the finish. 4 H 22m. This year I felt I was better prepared, I had gotten used to running on concrete and had no injuries having adapted from heel to midfoot strike and using cushy Lunarglides. I moderated my pace expectation to 4H time hit the half way mark bang on the nail, got to the 30K mark but again had to stop not because of cramp but because my legs were rigid and just would not respond. I am pretty sure I never went anaerobic in those 30K and the rest of me felt great. I had to hobble then walk and eventually jog in. 4H 45m. I took it very easy after stopping as I am only interested in trying to run the race and did not want to do any further damage. Both years my peak distance weekly was 80 kilometers. I did not carbo load for 1st yr but did this consuming about twice the ammount of carbohydrates to normal over Thursday, Friday and Saturday the race being at 4.15 Sunday morning. During training I have to tolerate extremely hot conditions and obviously have to be careful not to overdo it in the heat. Race conditions on both occasions have been perfect cool at that time of morning. Since my 2.59.19 when I was 50 I have led a reasonable decent life healthwise do not drink much a beer or couple of glasses of wine with dinner and I do not smoke and have had no illnesses in between time. The major differnce to my training now is that there are no hills at all here and all my runs then finished with a good slope. I did no speed work as such that time and very little tempo work. This time I have done tempo work and a little faster running but no reps as such. I think I need to replace the hill work somehow. Increase total mileage and chose a training plan and stick to it. I never have any recovery trouble even today the day after the latest marathon attempt I could go out and run 20k without any trouble at all. I won't but I could. I'm having a sit down today. I would be really interested to hear what you think. I am prepared to put in some hard work but always have to be careful as the concrete is punishing and the tarmac is not particularly safe. Maybe rigidly structured training is what I need. Please tell me what you think. Thank you for your question about marathon running. The marathon is a cruel distance. You prepare all that time, battle through injuries and hours, days, months of training only to see it all slip away at the 30k mark. Your story is oh so familiar. For most of us the answer is fairly simple: put in more work. Obviously given your age, you'll have to take some more care than 'young dogs' when increasing mileage and pushing up the work load. Whether more mileage is indeed the answer depends a lot on how much mileage you are doing now and how many running workouts you currently do. I am assuming you are running 4-5 times a week, one long run, mostly easy paced runs and a once-in-a-while tempo run. In addition to the long run, do a mid-week mid-long run, at least 90 minutes in length. Do one weekly tempo run. Hill work is a great way to strengthen the legs. Tempo runs are really good as well to build up leg strength. Make sure you do sufficient long runs around the 30k mark. That's so essential. In order to run a fast marathon you need to be able to cover that type of distance fairly easily. A good alternative to the 30k long runs is a run-walk approach. 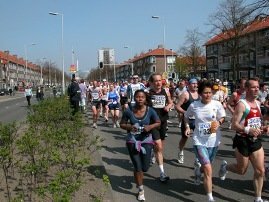 Marathon Training Tips - some further advice regarding marathon training. Marathon Training Nutrition - Tips regarding marathon training and nutrition. It looks like you are doing some good work there with the carbo-loading. For a structured marathon training schedule I can refer you to my Best Running Coach service. You can choose between continuous support or a marathon training schedule set up by me based on your own personal circumstances. Wishing you best of luck in your upcoming training and in your next marathon!